The Barbary Partridge, Alectoris Barbara, belongs to the family Phasianidae, and is distinguished from other partridges by its blue-grey bib framed with chestnut brown. It is described as having ‘a brown crown/ventral nape which shows up well on raising, resembling a Mohican haircut’. The partridge’s plump body and short bill are typical of Gallinaceous birds, which include pheasants and grouse. 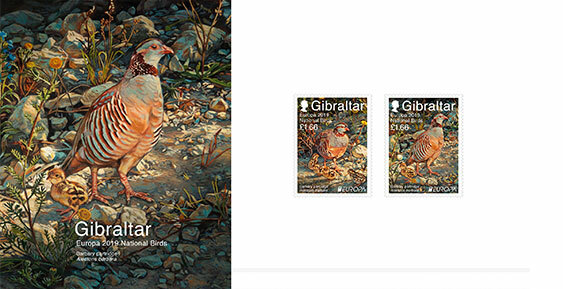 Gibraltar’s Barbary Partridge will never be prized for its song which is described as a ‘series of shrill, broken monosyllable clucks with interposed double notes’ (scan the stamp with the Cee-app to listen to the bird). Its meat however might be a little more appealing to some, and that is possibly how the birds originally came to the Rock. Predominantly a North African species, Gibraltar is the only mainland European location for a self sustaining wild population (they are also found off shore in the Canaries and Sardinia). It is unclear whether the birds were imported during the Moorish occupation of the Rock, brought over by the British in the mid 1700s as part of a consignment of ‘game from Barbary’ or if the population is indigenous. Possibly the answer lies with a combination of all three. Fossil remains of Alectoris partridges dating from the late Pleistocene epock ( 1.6 to 0.01 million years ago) have been found on the Rock, but it is possible that these birds were ancestors of the red-legged partridge. Alectoris rifa, which is common in Spain but not found in Gibraltar. Genetic Research as part of the programme agreed with ASC Systems is planned to try to determine whether the Gibraltarian Barbary Partridges are genetically different from the population in North Africa and elsewhere and this should establish their origins. The first record of Barbary Partridges on the Rock was noted by the Reverend John White in 1771 and at this time they were well established in the open scrub of the Upper Rock which was kept clear by grazing goats. Their range and number have dwindled in recent years as a result of several factors. The first is loss of open vegetation due to the growth of dense scrub and woodland on the Rock. This denies the birds their preferred low scrub for nesting and open ground for foraging. Disturbances, illegal catching of young and heavy predation by feral cats has worsened the situation even further to the point that perhaps only 30 pairs remain.